Premium Compatible Samsung MLT-D1082S Toner Cartridge 2 Pack. Samsung ML-2240 is a laser monochrome printer that is best suited for many workgroups. As it specialises in one function, it becomes an advantage of this monochrome printer over other printers. Samsung ML-2240 uses black Samsung ML-2240 toner cartridges which have a page yield of 1,500 pages and maintains a monthly duty cycle of 8,000 pages. As it weighs 6kgs only, it is lightweight and easy to carry. It is small in size with a width of 13.9 inches, depth of 11.7 inches and a height of 8.2 inches. It has an input tray with a capacity of handling 150 pages and an output tray which can handle 100 pages. It prints at a speed of 22 pages of black and white per minute with a print resolution of 1200 x 600 dpi which is quite impressive. It can be connected to PC through a USB connection. The media sizes it can print are - A4, B5, C5, Folio, Legal and Letter A Size. Also it can print cards, envelopes, labels, plain paper and transparencies. It has a sound emission of 33 dB when idle and of 51 dB when it is operating. The Operating Systems required for the printer are Apple MacOS X 10.3 - 10.5, Linux, Microsoft Windows 2000, Microsoft Windows Server 2003, Microsoft Windows Vista and Microsoft Windows XP. Samsung ML-2240 is a laser printer that is versatile and has a good printing speed. It can print on various media types and can print on cards, envelopes, labels, plain paper and transparencies as well. It is monochrome and uses black Samsung ML-2240 toner cartridges with a page yield of 1,500 pages. Q. For how long can I preserve compatible Samsung ML-2240 toner cartridges (not original) before using them? I am unable to print for weeks at times due to frequent travel for work. A. The shelf life of these toner cartridges is approximately three years. Compatible cartridges also last that long, so choosing them over the genuine brand will also help you save a good amount without any difference in the quality of output. Q. Is it really alright and safe to shake toner cartridges to get them to print more? Is there any chance of damage to the cartridge when it’s shaken? A. Yes, shaking toner cartridges lets you print some more pages as it loosens up toner powder blocked inside. Though shaking the cartridges doesn’t cause damage as such, it’s advisable to do it briskly yet gently for about 20 times taking care that it doesn’t come out of the cartridge. Q. I have spare Samsung ML-2240 toner cartridges which have to be stored securely. Can you please clarify whether they should be stored at room temperature or in cooler environs? A. You can store your toner cartridges at either; if you happen to live in a place which is rather hot, it will be better if you store them in a cooler temperature. You need to protect the cartridges from heat and dust. Q. If I place an order for Samsung ML-2240 toner cartridges and need them urgently, what arrangement could you make to deliver them the next day? A. We are equipped to offer 1-2 days’ delivery of orders which we execute successfully in normal situations which are determined by stock availability, transportation situation and location not being a very remote area. The orders also have to be placed by 12.00 noon to expedite delivery. We’d like to add that our success rate of next day delivery stands at 98%. Q. Can I dispose off my printer accessories along with the other household items? Will it make any effect on the environment? A. When you find some sign of dustbin with a cross on the product box or on the printer itself, this indicates that the product and its accessories should not be disposed off with the other household waste at the end of their working life. This should be done to prevent the possible damage to the environment or human wellbeing that one can get from the uncontrolled waste disposal. It is recommended to separate these items from other types of waste and recycle them responsibly to promote the economic reuse of material assets. Q. Does this printer print only in black? How many pages can I expect to print in a month? A. Yes, the Samsung ML-2240 is a monochrome printer that supports printing through black only. The page yield of this printer is around 1,500 pages with a monthly duty cycle of printing 80,000 pages. Q. Is the Samsung ML-2240 toner cartridge compatible with any other printer? A. These toner cartridges are specially designed to fit in multiple printer models. 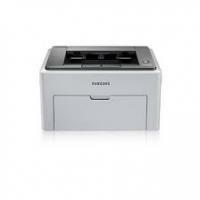 They are compatible with the printers: Samsung ML, Samsung ML-1640, Samsung ML-2240, and Samsung ML-2241. Q. Can I print quality pictures with the Samsung ML-2240 toner cartridges? A. The printer supports only black and white printing, so colour printing cannot be done using the Samsung ML-2240 toner cartridges. Thus you cannot print pictures with this printer. Q. I do not use my printer frequently. But yesterday when I start my printer, the machine does not print or print blurry pages. I don’t know what happens to my printer. Can you please guide me how can I resolve this issue? A. Thanks for the question. As you have mentioned that you do not use your printer on daily basis, this can clog the printhead inside the printer. This happens when the printer is not used frequently for printing purposes. To avoid this kind of issue it is recommended to clean the cartridges and print a test page frequently to continue with the smooth functioning of the machine.